**Oops! I was trying to schedule this post for Thursday but hit the "publish" button too soon! Sooo, if you happen to read this post on Wednesday, just know that it was meant for Thursday! Good Morning and Happy Thursday to you! I think I am going to town today to get my new prescription sunglasses...first pair EVER! I need to explain; by going to town I mean a 1 1/2 hour drive each way:( However, I amuse myself with an audio book and if someone else is driving, my knit/crochet project of the moment so the time passes quickly. When "in town" we go to Costco, have lunch in a restaurant (my favorite part), get a pedicure (every other month) and run miscellaneous errands. Today I am hoping to pick up the supplies to make my darling granddaughter a bunkbed for her American Girl dolls. I cut the circles out with my Circles Framelits Collection then adhered them to the Whisper White cardstock. 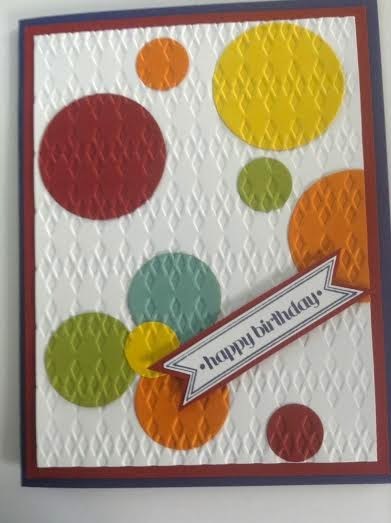 Then I ran the Whisper White cardstock with the circles on it through the Big Shot using the Argyle Embossing Folder. I love how using the embossing folder actually makes the circles almost melt into the Whisper White cardstock. Very cool! I hope you enjoyed the card today and that you will feel inspired to do a little "creating" yourself! Have a great day and thanks for stopping by! 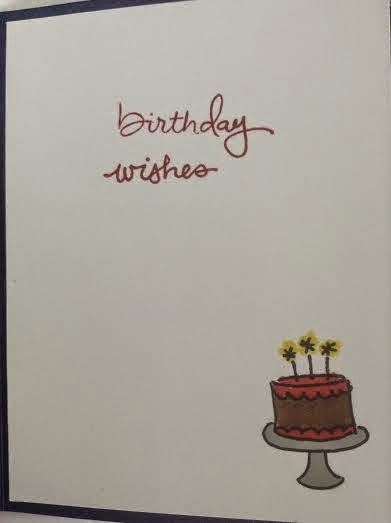 Labels: birthday cards, Endless Wishes Photopolymer, Itty Bitty Banners, Stampin' Up! You did good work with this! Thanks, William! It was fun! I love it! Simple and cute! Tasty Tuesday and a Winner!